Rochelle Intermodal | N Scale layout » Blog Archive » First light installed! A very productive long weekend. I finished installing the plywood walls (just the pillars to do now) and have almost finished the roof woodwork – I sort of miscalculated the wood needed and am short of a few lengths! 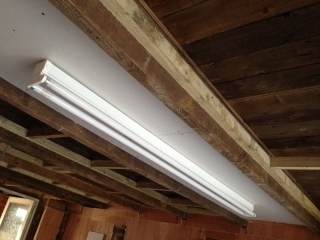 Plus I somehow forgot to order the last few insulation boards…so I couldn’t finish insulating the ceiling! Doh! 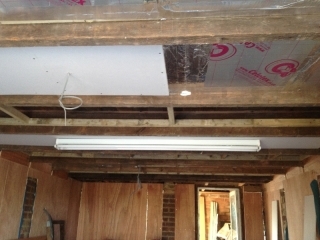 But at least the framework is in place and ready for insulating. But the most exciting bit is that I installed plasterboard on the ceiling in 2 places – and installed the first fluorescent light fitting! Next weekend I will get the rest of the ceiling insulated and then my good friend Graham from my railroad club is coming next Wednesday to help me with the rest of the ceiling – a lot easier with two people! So, here are photos part of the ceiling and of the new light fitting – the end is truly in sight!